– In his Pocono Raceway debut, Spencer Pigot was hit from behind by another driver coming to the green flag and dropped to last before even turning a lap. However, Pigot’s car was repaired and he was able to manage a 16th place finish by rejoining the race. – A one-hour practice session kicked off the ABC Supply 500 weekend and Pigot’s No. 21 Fuzzy’s Vodka crew continuously improved his car throughout the session. Pigot turned 31 laps, his first ever at Pocono Raceway. His final lap of practice was his fastest at 214.220 miles per hour (mph). – The qualifying order for oval events is set in the reverse order of entrant points, meaning Pigot would be the first of the Ed Carpenter Racing entries to qualify. Laps of 214.815 and 215.540 gave Pigot a two-lap average of 215.177 mph. Pigot would start 16th, next to his Fuzzy’s Vodka teammate and team owner Ed Carpenter in Row 8. Saturday’s second practice session was cancelled after heavy rains moved through the area. – It was a messy start to the 200-lap race on Sunday as Pigot was hit from behind by Graham Rahal before they reached the start/finish line. The contact sent Pigot spinning across the track, tapping the inside wall with the rear of his car. Because he was not able to drive the car back to his pit box, Pigot was taken to the medical center but immediately released. He returned to pit lane where his No. 21 Fuzzy’s Vodka crew were already working to repair the damage. – A multi-car accident broke out on Lap 6, just following the restart and necessitating a red flag. Since Pigot was already several laps down and would lose no additional positions, the No. 21 crew continued their repairs. When the race resumed, Pigot would be assessed a two-lap penalty for unapproved work under a red flag. Once lengthy repairs were completed to the Turn 2 fencing, engines were re-fired. Pigot was held in his pit box for two laps and rejoined the field in time for the Lap 12 restart. – By completing six laps, Pigot moved ahead of all cars involved in the Lap 7 incident and moved up to 17th. Only four laps later, Kanaan exited the event, handing Pigot the 16th position. The team then made the decision to retire the No. 21 from the race, feeling maximum points had been gained given the circumstances. 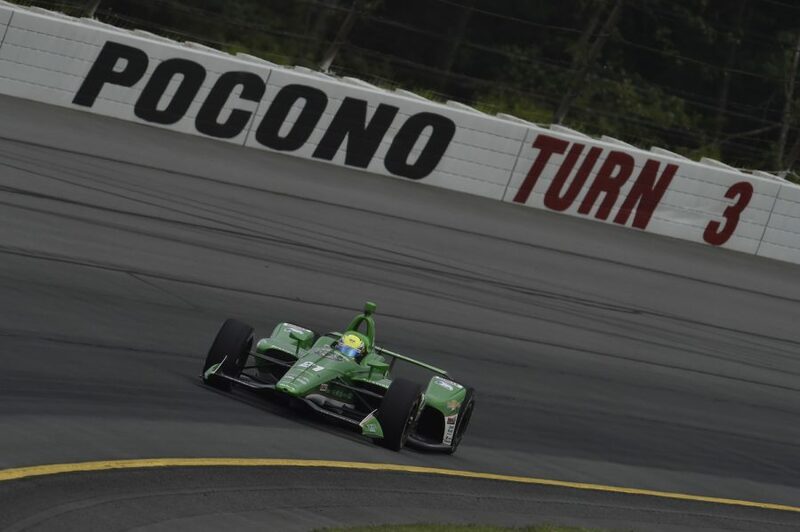 – Pocono was the first in a string of three back-to-back race weekends as the Verizon IndyCar Series embarks on a cross-country stretch to wind down the 2018 season. Next weekend, Pigot will race at Gateway Motorsports Park, a 1.25-mile oval just outside of St. Louis. The Bommarito Automotive Group 500 will take place on Saturday, August 25 with a live broadcast on NBC Sports Network beginning at 7 p.m. local (8 p.m. ET).